With the Cowichan River so low, will we run out of drinking water? We will not run out of drinking water. North Cowichan draws most its residential water from an underground aquifer, not the Cowichan river. There are some exceptions, like Chemainus and Crofton. Crofton gets its residential water from the Catalyst mill, which draws water from the Cowichan River. Catalyst has an agreement with North Cowichan to provide residential water to Crofton, unless the mill shuts down. We had word this week that Catalyst does not anticipate shutting the mill this summer, even though their productivity may decrease due to a reduction in the amount of water they draw from the river. If the mill did shut down, Crofton’s back-up water supply is Crofton Lake. Chemainus gets its drinking water from a well part of the year and from Banon Creek for the rest of the year. North Cowichan is working towards drawing water from the Chemainus wells year round. There is an updated description of the Chemainus well project on the North Cowichan website. Is the aquifer full of water? The Ministry of Environment (MoE) and the Ministry of Forests, Lands, and Natural Resource Operations (FLNRO) monitor water level, temperature, and obtain samples for groundwater quality on a semi-annual basis. You can view water-level graphs on North Cowichan’s wells here (wells 204, 211, and 318 are along the Cowichan River; Chemainus is 355). These reports are showing no trend in decreasing water levels in the aquifer over time, meaning it replenishes every winter. You can see that in years past there was slightly more water in the aquifer than there is today, and that this year levels are around the historical minimum or average. If our groundwater is plentiful, why do we need to adhere to water restrictions? I believe there are two main reasons why we are asking residents to continue to drive dirty cars and let our lawns go brown: caution and uncertainty. We are being cautious because we don’t know how much rain and snow is on its way this (and every) year to recharge the aquifer. Will post study results here when available. It’s impressive how many residents have made adjustments to their water use beyond adhering to the water restrictions: Pouring half-drunk glasses of water into plants, emptying bath water onto flower gardens, taking pride in one’s dirty car. 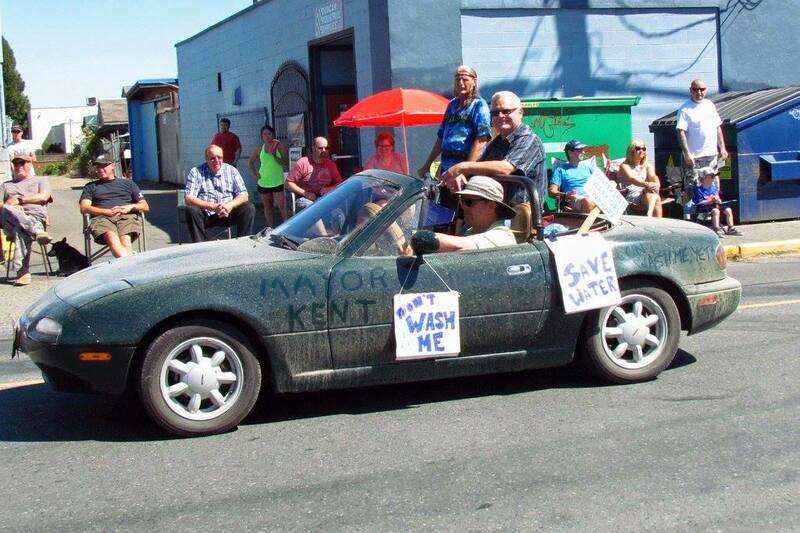 Mayor Phil Kent at this year’s Duncan Dayz Parade. There are those who have yet to embrace this change. Social media is being used to compare North Cowichan homes with green lawns to the golden brown lawn—this year’s trend—next door. While shaming neighbours publicly may be popular in California, and may change behaviour, there are more friendly ways of addressing the issue. Let them know why we’re restricting water use (see above). Tell them how to research the issue for themselves at the resources below. Ask our bylaw officer Rob Clark (250-746-3100) to stop by for a chat. Visit the CVRD’s The New Normal Cowichan website for up-to-date data on the Cowichan Valley’s above and ground water sources. Most of us are aware of the great concern about the Cowichan River, but for a succinct summary, read this article that appeared on the front page of the Times Colonist. For more information, visit the Cowichan Lake and River Stewardship Society. Find data on North Cowichan’s wells here (204, 211, and 318 are along the Cowichan River; Chemainus is 355). Register complaints with Rob Clark, Bylaw Officer: 250-746-3100. Keep in mind, Rob is part-time bylaw officer, part-time assistant fire commissioner, so if you don’t hear from him immediately, or if he doesn’t deal the complaint right away, he’s dealing with other issues. Be assured, your request is on his list. If you were going to use Crofton lake as a water supply again, you certainly need to get lots of notice from Crofton mill before they shut off the water as the lake needs lots of work and money spent on it before it could be used as a water source again. Have you been to the lake? ?